Facade Manufacturer Alucobond; Sobotec Ltd. 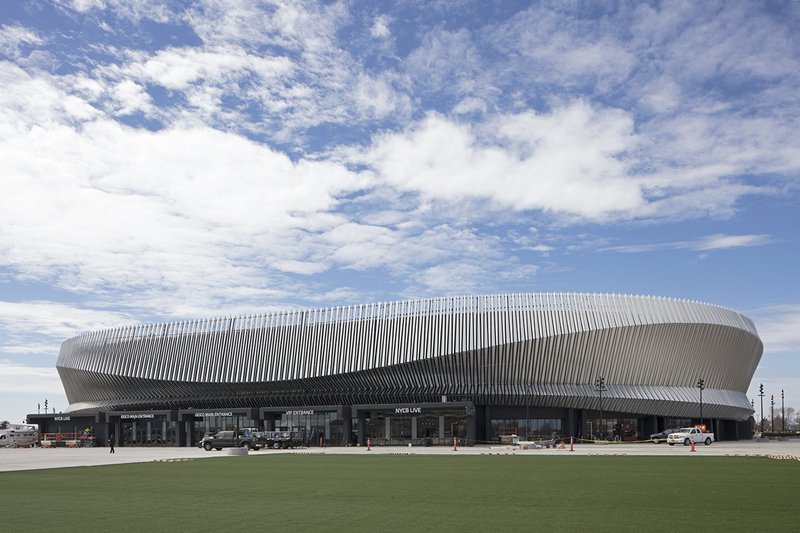 Originally opened in 1972, the old Nassau Veterans Memorial Coliseum on New York's Long Island was given a facelift and interior renovation by SHoP and Gensler respectively in 2015. SHoP’s team relied on the concrete massing of the 1970s structure to shape a new facade composed of over 4,700 brushed aluminum fins that wrap the building in broad sweeping curves. The project, which benefitted from a rigorous digitally-conceived workflow, delivered the new undulating facade geometry by precisely varying each of the fins in profile and dimension. Two primary fin shapes are designed from one sheet of aluminum composite material (ACM), minimizing waste while highlighting SHoP’s commitment to a design process that is tightly integrated with fabrication and assembly processes. John Cerone, associate principal at SHoP, told AN that one of the successes of the project is the new facade's reflective effects that pick up on colors of the surrounding landscape. This is especially evident during sporting events where crowds wearing the home team’s colors reflect onto the facade. The project in many ways mirrors SHoP's success with Barclays Center over five years ago—same client, same building type, similar design process. When asked what, in this project, arose as a surprise or a challenge to the design team working on Nassau, Cerone candidly said, "Nothing!" He elaborated, "As we continue these projects, it's a continuous iteration: We recycle process. I don't think this industry does enough of that." "Don't ignore fabrication constraints and input from contractors," Cerone said. The fins are planar and negotiate a ruled digital surface, which was informed by early feedback from fabricators and contractors. "An intelligence builds from doing other projects like this. While the componentry and hardware differ, the actual process of how you structure the model and develop methods of automation improves with experience." The architects cite simple definitions which they adopted and advanced from prior projects which help to automate the generation of parts for geometrically complex assemblies. "This to us was a proof. It's a great testament to not being surprised by the process," Cerone said. The design process for SHoP was initiated with a laser scan of the existing arena, resulting in a highly detailed topographic mesh surface that became the base geometry for forthcoming design and fabrication models. The framework of the new skin was designed as a long-span space frame, springing off massive existing concrete piers that were, in the words of Cerone, impressively over-structured. The resulting structural subframe was assembled on the plaza level of the stadium and craned into place. Only 32 “mega-panels” were required. "Facades are the closest you can get to manufacturing in architecture," Cerone said, "but we are looking towards using this process throughout the building. How can it inform the superstructure and the interior? We are working to scale this process up." St. Louis, Missouri, may be getting a new building or two from Tatiana Bilbao if plans for a new complex move forward. 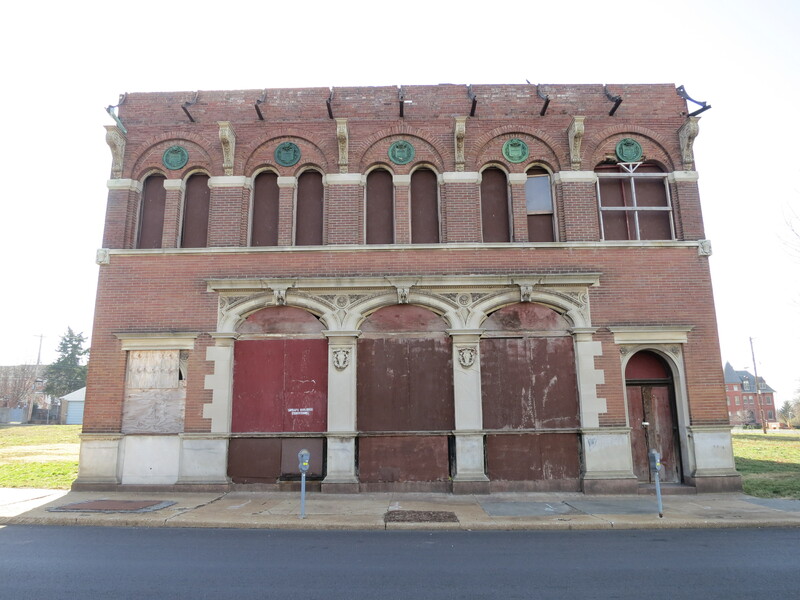 The St. Louis Post-Dispatch recently reported that an unconventional team of developers has assembled to redevelop a mostly vacant block in the city's Grand Center Arts District. The team plans to recruit other high-profile architects to design housing and amenity spaces. The development's site is a block bounded by Vandeventer Avenue, North Spring Avenue, Olive Street, and an alley on its southern edge. The historic Henry L. Wolfner Memorial Library for the Blind sits empty on the site, and the developers have agreed to maintain and refurbish the building's front facade while tearing down the back and repurposing the interior for a "clubhouse" for the development. That renovation is being led by St. Louis firm Axi:Ome. St. Louis's Grand Center Arts District is a historic neighborhood home to many old and new cultural institutions like the Tadao Ando-designed Pulitzer Arts Foundation and the Allied Works-designed Contemporary Art Museum St. Louis, which both stand just a block from the proposed development's site. 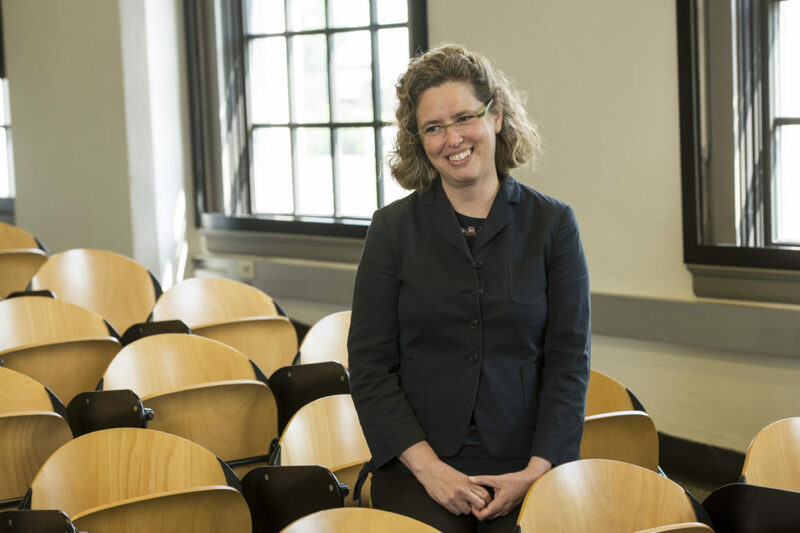 The development team is led by philanthropist and arts-patron Emily Rauh Pulitzer, who is joined by James Maloney and Owen Development's Steve Trampe, according to the Post-Dispatch. Pulitzer was the force behind the eponymous arts foundation building nearby. Although the team wants to bring big-name designers to the project, they apparently intend to keep the development affordable to middle-income buyers and have stressed that their intention is not to maximize profit but to boost and revitalize the local neighborhood. The budget for the project comes to $30 million, and it will potentially include "23 housing units in 17 buildings as well as an apartment building with 20 or so units," according to an earlier article from the Post-Dispatch, and the developers hope to start construction early next year. The intensive revamp of the landscape and museum under the St. Louis Gateway Arch is finally complete and open to the public, capping an eight-year process just in time for the July 4 holiday. Lack of accessibility and awareness have historically been major issues in attracting visitors to the museum. 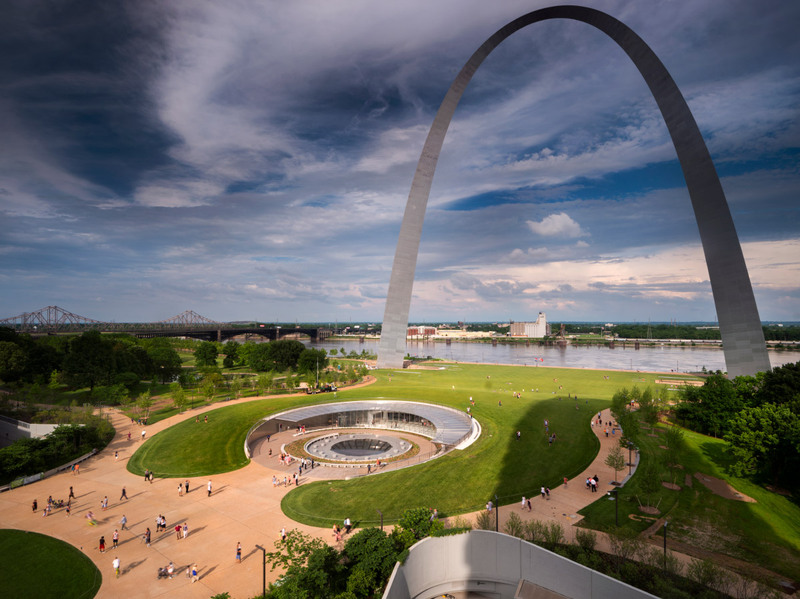 The museum sits at the base of Eero Saarinen’s soaring gateway to the American west, which was originally envisioned as both a tribute to westward expansion and as a way to clear low-income waterfront property. Gullivar Shepard, Principal of Michael Van Valkenburgh Associates (MVVA), which has been handling the redesign of the landscape beneath the arch since 2010, said: “Eighty percent of visitors don’t even know there’s a museum underneath the arch.” That’s changed radically since the CityArchRiver Foundation (now the Gateway Arch Park Foundation) kicked off a competition in 2010 to re-envision the campus while respecting Saarinen’s and the original landscape architect Dan Kiley's vision for the 91-acre park. The completed museum now takes center stage beneath the arch and acts as a link between the Old Courthouse and the recently covered Interstate 44 to the west, and the Mississippi River to the east. 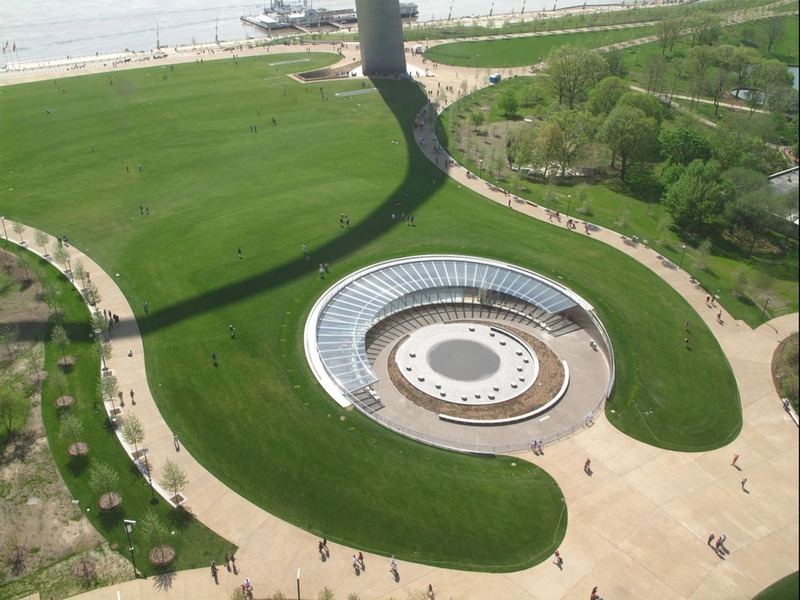 The Museum at the Gateway Arch uses its sunken, circular form to carve out wide views of the St. Louis skyline without impacting sightlines towards the Arch. That was a deliberate choice on the behalf of New York’s Cooper Robertson and James Carpenter Design Associates (JCDA), who, with the St. Louis-based Trivers Associates, renovated and uncovered the existing Saarinen-designed museum. “The new West Entry and Museum expansion [are] discretely incised into the landscape,” said James Carpenter, Founder and Principal of JCDA. “This welcoming gesture is announced by an arc of glass laid flat on the ground, reflecting the image of the sky above, while the Arch itself scribes an arc against the sky beyond.” The ribbed glass canopy above the museum’s entrance serves to reduce the outside natural light and ease visitors into the subterranean museum, which has been programmatically transformed. The museum, formerly the Museum of Westward Expansion, will now focus more on the design and construction of the Gateway Arch itself and present more diverse narratives in American history. Inside, the museum’s layout follows the natural contours of the surrounding landscape. The lighting has been designed to keep a consistent level of brightness as visitors move from the glass entrance to the underground galleries. The wraparound paths have been laid out to funnel traffic to the west-facing entry, as visitors coming from either side converge at the entrance and are presented with framed views of the Arch and courthouse. ﻿ A time-lapse video of the museum's construction, courtesy of EarthCam. We have to imagine a place before we can actually be there. So St. Louis–based artists and curators Gavin Kroeber, Tim Portlock, and Rebecca Wanzo invited their fellow citizens to imagine the urban future with “a two-day festival of art and ideas that explores the collisions of race, urbanism, and futurism, providing a platform for alternate visions of the St. Louis to come.” The name of the event, “Dwell in Other Futures,” comes from the novel Dhalgren by the Afrofuturist writer Samuel R. Delaney, who also served as the keynote speaker and underpinning force that bound together a number of the program’s participants. To open the event, Delaney recited a chapter from his most recent novel that bolstered the role that intimacy might play in how we understand our spaces. Held on April 27 and 28, the program included a collection of workshops and presentations, with special emphasis on performances. 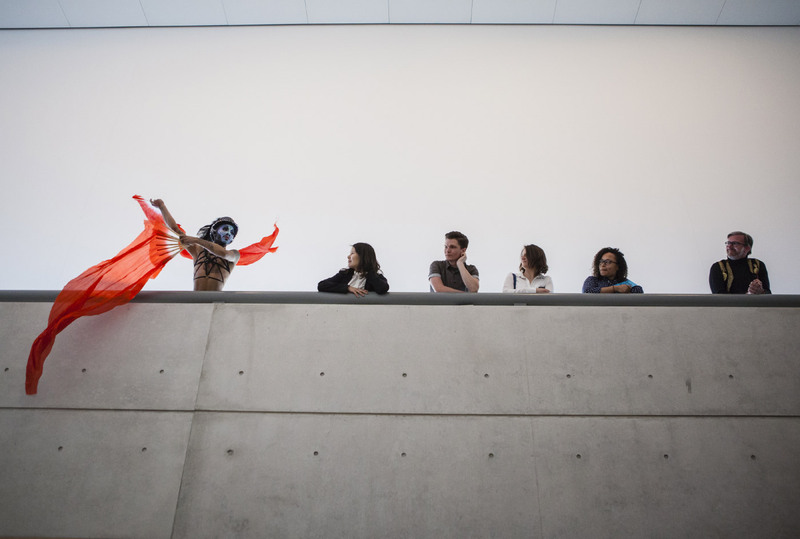 For example, the multidisciplinary artist Eric Ellingsen, along with his team of Tyvek-hazmat-suit-clad landscape architecture faculty and students from the Sam Fox School of Design and Visual Arts, invited the public to join as they performed a choreographic ritual on an empty land parcel across the street from the Pulitzer Foundation. Inspired by the spray paint markings that often indicate underground utility lines, Ellingsen’s team challenged the audience to assume agency over the colored ground markings that make up our cities in order to speculate how infrastructure may connect us in more creative ways. Children and adults took charge of rolling paint applicators to inscribe the site with colorful lines while an overhead drone recorded the real-time mapmaking from a bird’s-eye view. Inside, artist Autumn Knight invited audience members to offer impromptu proposals for civic institutions as part of her La-A Consortium performance, positing playful yet bureaucratic titles such as “Shephanique Center for Literacy” and the “Jadavian Center for Creative Ecologies” as a starting point. By leveraging the power of intentional naming, Knight prompted the audience to consider how they might creatively impact the identities and activities of the organizations that constitute our society. The event closed with a bang as six different local participants delivered “Manifestos for a Future St. Louis.” These brief, bold, and highly choreographed proclamations required each participant to articulate a scenario about a possible future through whatever artistic means necessary. Architectural historian Michael Allen delivered a prescient soliloquy set to a Hollywood soundtrack, warning of a “non-topian” future that intensifies our troubled present, brimming with privatization and distrust of the public sphere. Maxi Glamour, the self-proclaimed “Demon Queen of Polka and Baklava” projected a nonbinary, gender-fluid future enacted by a spectacular drag performance. Social practice designer De Nichols closed the series with an optimistic call to action, imploring us to consider what parts of the status quo need to be destroyed in order to make space for “audacious” culture-makers and “fearless” justice-makers. What conclusions did the festival draw? Its participants proposed more questions than answers, implicating the audience every step of the way, but most assuredly, the celebratory collective voice proclaimed that the future will be black, the future will be queer, and the future city demands all of our emphatic participation. Along with a team of artists, planners, and architects, Stoss Landscape Urbanism has won a competition to knit St. Louis into a walkable, bikeable green strip between the Gateway Arch and Forest Park, the city's largest, on the western end of town. The St. Louis nonprofit Green Rivers Greenway asked L.A.- and Boston-based Stoss and three other teams to link the riverside to the center of the city for the Chouteau Greenway. A citizens' group, the Chouteau Community Advisory Committee, worked with local organizations organized under the Chouteau Design Oversight Committee to review the designs in public fora. According to ArchDaily, over 2,000 residents responded to Green Rivers Greenway's survey soliciting input on the designs. Stoss's win was first announced in early May. Stoss is calling its concept The Loop + The Stitch, a nod to the circular bike and foot path (outlined in green, above) that will connect downtown and the Gateway Arch to Forest Park and Washington University in St. Louis, home to the well-regarded Sam Fox School of Architecture. The "stitch" portion, delineated in magenta, links the city's north and south neighborhoods together and to the "loop" with pedestrian infrastructure. Stoss collaborated with Marlon Blackwell Architects and five other firms on its design. Great Rivers Greenway is overseeing the first segment of the project, between Boyle and Sarah avenues. A now-under-construction MetroLink light rail station, funded by a $10.3 million TIGER grant, will connect with the Greenway along this leg. The station will be completed later this year, as the Stoss team works with stakeholders to finalize its proposal. This isn't the first major landscape project to shape St. Louis recently. 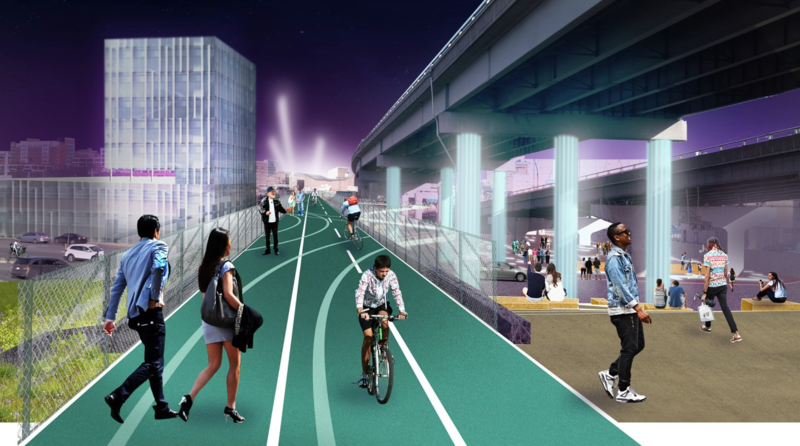 Last fall, Brooklyn's Michael Van Valkenburgh Associates (MVVA) debuted CityArchRiver, its plan to reconnect Eero Saarinen and Dan Kiley’s Gateway Arch and landscape with the rest of downtown over a portion of I-44. “Our project is at the end of a seventy-year project,” said Gullivar Shepard, principal at Brooklyn-based Michael Van Valkenburgh Associates (MVVA), of his firm’s St. Louis CityArchRiver design. Back in 2010, MVVA’s team won a competition to rework the landscape around the St. Louis Gateway Arch—technically the Jefferson National Expansion Memorial—to make it more universally accessible, easier to maintain, and more integrated into its urban context. Expanding and popularizing the site’s little-known museum was also a key goal. While the client was technically a foundation, the firm would have to work closely with the site’s owner and preservation-minded steward, the National Park Service (NPS). The challenge was complex: The landscape was hardly a clear-cut expression of Eero Saarinen and Dan Kiley’s designs. Kiley was on Saarinen’s original design team, whose 1947 proposal won the memorial competition. But the project languished until 1957, when funding became available. Saarinen and Kiley were internationally renowned by then, “so they went back to the drawing board, literally, and came up with a new design for the memorial,” said NPS Historian Robert Moore. “Basically, it evolved from a rectilinear-looking plan to a very curvilinear plan that echoed the curves of the arch itself.” Moore described how the curving paths and ponds were Saarinen’s ideas, while the allées and cypress circles came from Kiley. The NPS subsequently stepped in and became involved in the design, thinning out Kiley’s dense vegetation. After the completion of a 1964 “final landscape plan” with Kiley (Saarinen had passed away in 1961), the NPS continued without him. Money to build the landscape only became available in earnest in the early 1970s, with much of the landscape elements in place by 1974, though final plantings were made in 1983. During this time, the NPS made small changes to Kiley’s ponds and the special stairs Saarinen had designed. “Again, [there were] many hands in the design,” said Moore. The resulting shortcomings are numerous. Eighty percent of visitors, said Shepard, don’t even know there’s a museum underneath the arch. Many drive in from the highway, park on the on-site parking lot, take the tram to the top, and leave. The park is also cut-off from the city by highways, which didn’t exist in 1947. MVVA broke down the proposed interventions into 14 key decision points, each a constituent part of a larger landscape resuscitation. 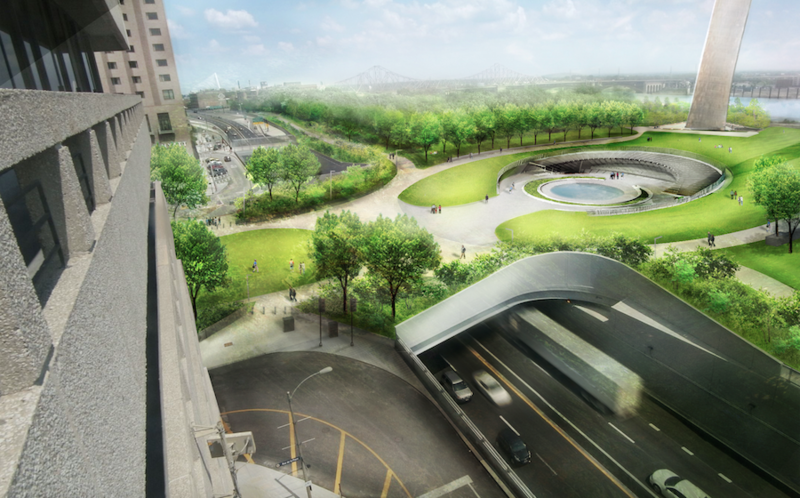 Ultimately, key interventions included building new, fully accessible paths—embedded in the landscape—that snake down from the arch plateau to the river, replacing the allées’ infestation-prone ash trees with London plane trees, and bulldozing the parking lot to create a new seven-acre park that connects to Washington Avenue, a major urban corridor of St. Louis. The biggest (and perhaps most controversial) intervention was a new circular museum entrance embedded in a berm that leads up to the arch plateau. A new vegetated bridge, which leads directly to the new museum entrance, will replace caged highway overpasses. While the stakes are high for the memorial, this project could have broader implications for other NPS sites. “This was the project that everyone in the Park Service has been very carefully watching,” stated Shepard. If the NPS, an organization “not built for change,” can successfully update a complex site like this, then perhaps similar projects could be possible in other cities. Washington University at St. Louis Sam Fox School’s College of Architecture has announced Pedro Pitarch as the winner of the annual James Harrison Steedman Memorial Fellowship in Architecture. Madrid-based Pitarch won for his proposal, “Disguised Metropolitanisms: Unveiling the Masquerade of Urban Domesticity.” The biennial fellowship includes a $50,000 award, making it one of the largest of its kind in the United States. 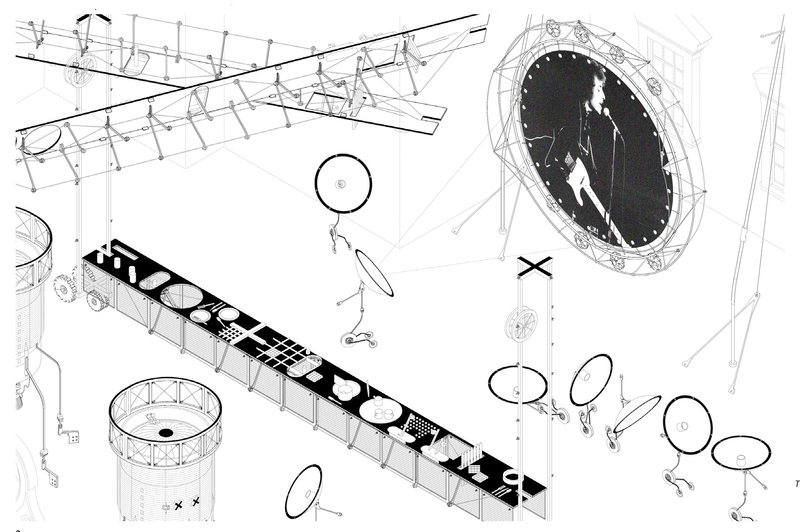 “Urban and domestic spheres have no longer clear boundaries, but faded ones,” Pitarch explained. “They are no longer distinguished according to a public/private [duplex], but to the possibility of use in a certain moment. They are more dependent on questions such as ‘when and how,’ rather than ‘what or where.” The fellowship will allow Pitarch to research the intersection of public and private spaces across Europe, Asia, and the United States. Throughout his travels, he will explore unconventional domestic situations andsix typologies of urban domesticity. For example, in Tokyo and Taipei, he will look at public infrastructure as a resting place, or has he calls it This Train is my Bedroom. Pitarch will conduct interviews, take photos, and produce analytical drawings of each typology, with the end product of a book, a short film, and exhibition models. With this year’s theme, “Adaptation,” 100 applicants from around the world proposed ways in which adaptive responses might be better used in the design process. The Fellowship jury was chaired by Toronto-based Lateral Office’s Mason White. The jury also included Yale School of Architecture Dean Deborah Berke, Elena Cánovas, principal and co-founder of aSZ arquitectes and a professor of practice in the Sam Fox School, Joyce Hwang, director of Ants of the Prairie and associate professor at the State University of New York at Buffalo, and Jeff Ryan, principal and director of design at Christner Inc. “The jury was impressed with Pitarch’s range of experimentation and invention,” White explained. “Several jurors noted that both his previous work and the proposed research show an approach that is at once methodical, experimental and fantastically intricate. Additionally, the subject of property was found to be timely and relevant worldwide.” The jury also awarded and alternate award and two honorable mentions. Elizabeth (Lizzie) Yarina, a research associate at the MIT Urban Risk Lab, for her proposal, “New Climate Nomads: Indigenous Spaces of Migratory Adaptation.” Her work looks at the “socio-spatial identities of vulnerable indigenous populations in the age of climate risk.” Honorable mentions were awarded to Jin Young Song, founding principal of Dioinno Architecture in Seoul and Buffalo, N.Y., and assistant professor of architecture at the State University of New York at Buffalo, and Kirsten Caudill, designer with ZGF Architects and a Sam Fox School alumna. One Sam Fox School architecture student will also be awarded the Steedman Summer Travel Fellowship to support the student in international travel. The James Harrison Steedman Memorial Fellowship has been awarded biannually since 1926. The fellowship is jointly administered by the Sam Fox School of Design & Visual Arts at Washington University in St. Louis and AIA St. Louis. The St. Louis Cardinals National League baseball team is leading the way in reimagining the sporting-event experience. Phase one of Ballpark Village, completed spring 2014, was the mixed-use development surrounding the team’s Busch Stadium called Ballpark Village. After the success of this $100-million project, the team and the city are preparing to begin the second, more ambitious phase of the plan. With planning and design led by Denver-based architecture firm Hord Coplan Macht, Ballpark Village II will include residential, retail, hospitality, and office spaces. The development will consist of a pavilion with a 10,000-square-foot public market; a 29-story residential high-rise with 300 units looking directly into the stadium; 15,000 square feet of retail at its base; and a 10-story mixed-use building on the westernmost portion with 100,000 square feet of office space, 200 hotel rooms, and ground floor retail. The office space will be the first new Class A office tower to be built in St. Louis since 1989. 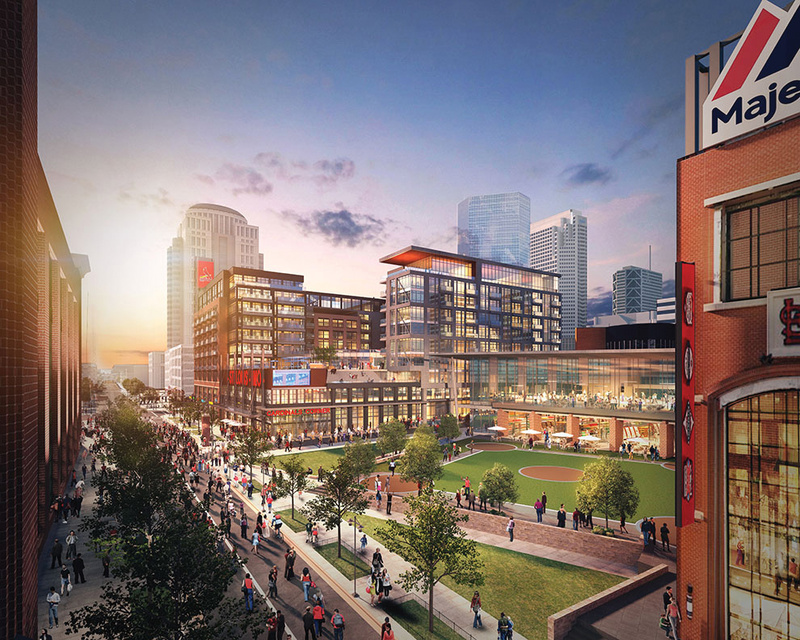 The development team plans to use the taxes generated by the phase one Ballpark Village project itself, in addition to private equity and debt investments, to finance $220-million Ballpark Village II. Currently, the project is waiting for the city to review a bill that would amend the existing development agreement, allowing the developers to pursue their latest, more ambitious plan, which includes the new residential and office towers. Mixed-use projects around new and old stadiums have become popular in cities hoping to attract year-round attendance to areas formerly used only for sporting events. Development of new offices, hotels, residential, and entertainment venues around the Chicago Cubs’ Wrigley Field is well underway. Detroit’s Little Caesars Arena, currently under construction, will be part of the redeveloping 50-block District Detroit. The arena will be the centerpiece of planned neighborhoods that will include six theaters; retail, residential, and office spaces; and three sports venues. A similar development and stadium for the Texas Rangers has been approved in a ballot initiative and will cost an estimated $1 billion. Though these more recent projects may be more ambitious in scale, there is no doubt that phase one of Ballpark Village is being used as a model—with an estimated $50 million in revenue in 2015, it has been deemed a major success. The next phase hopes to continue this success with the expanding of programs on the site. While the initial phase included mostly sports-related spaces, the new development will bring the Ballpark Village closer to being an actual village, and soon enough, Cardinals fans will be able to watch live games from their living rooms, maybe even in their bathrobes. This article appears on HoverPin, a new app that lets you build personalized maps of geo-related online content based on your interests: architecture, food, culture, fitness, and more. Never miss The Architect’s Newspaper’s coverage of your city and discover new, exciting projects wherever you go! See our HoverPin layer here and download the app from the Apple Store. 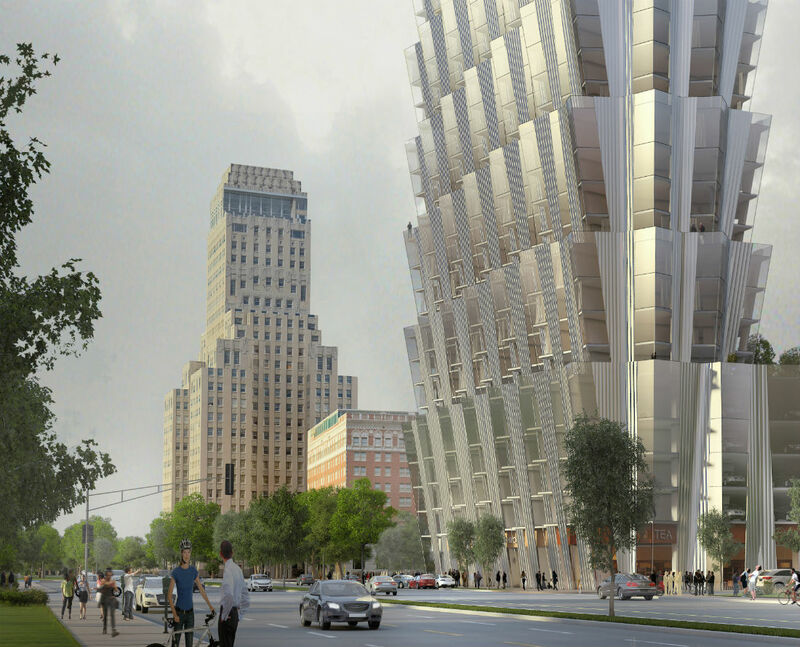 Chicago firm Studio Gang has released images of their new tower, "One Hundred" at 100 North Kingshighway Boulevard in St. Louis, Missouri. Backed by developer Mac Properties, the project is Jeanne Gang's first in the city and will look over Forest Park, rising above 350 feet. “In a climate with four distinct seasons, we wanted to make it possible for residents to enjoy the different views and natural changes in light over the course of the year,” said Gang, founding principal of Studio Gang in a press release. “By experimenting with the geometry of the facade and refining the apartment layouts, we were able to make every apartment into a corner unit perched above the park and city.” One Hundred's serrated and inwardly sloping facade (repeating every four floors) creates terracing, some of which will be shared among tenants. A green roof podium will be available on the sixth floor and further greenery will be used for the collecting and storing of rainwater. Meanwhile, other amenities include parking and an assortment of retail outlets at street level. “The Central West End is an extraordinary, architecturally rich neighborhood that has evolved over many decades,” said Eli Ungar, founder of Mac Properties. “In planning a development for this exceptional site, we selected Studio Gang for their commitment to thoughtful, sustainable development and to a design that both honors the history of a community and contributes to its continued evolution.” One Hundred is due to break ground next year, with completion pinned for 2019. Kansas City–based architect el dorado and developer Silliman have released schematic designs for a mixed-use commercial and multi-family residential project as part of a larger development, Cortex 3.0, a bioscience and technology research community in St. Louis. 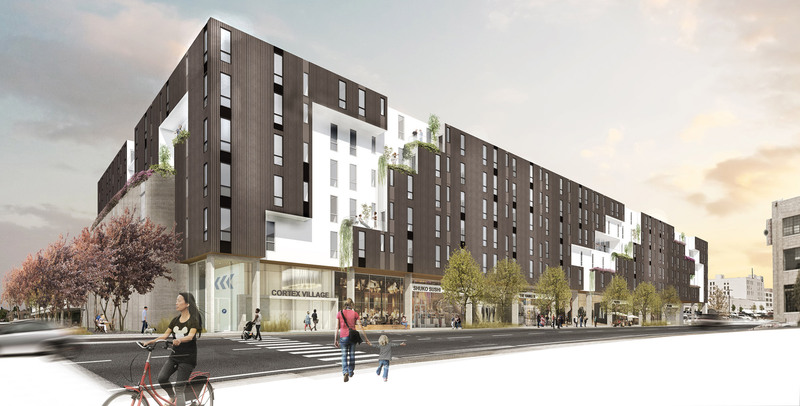 The project will include 180,000 square feet of residential and 20,000 square feet of retail throughout seven stories. The approximately 220 apartment units range from studios to two bedrooms and balconies are nestled in setbacks along the building facade. Though materials have not yet been designated, initial renderings envision the project wrapped in corrugated metal, referencing the site’s industrial past. The growing Cortex district will also include a hotel designed by Boston-based Group One and a new office building designed by the St. Louis office of HOK. El dorado’s project is expected to be complete by the end of 2018.